Psychology major Kaylee Miceli is spending her summer in Vietnam interning with students from Tan Tao University to explore how various treatment methods affect depression. When Kaylee Miceli decided to head up a neuroscience research study in Vietnam, there was only one problem: a plane ticket to Vietnam isn’t cheap. “I knew what I wanted to do, but there was always a financial barrier,” said Miceli, a rising junior who is a psychology major. Instead, she hunkered down in the library, trying to decipher Vietnamese research papers on mental health treatment in a part of the world she thought she couldn’t visit. But with financial support from the Carolina Global Initiative Award, Miceli boarded a plane to Ho Chi Minh City this summer to explore her interest in neuroscience in a way she never thought possible. An initiative of Carolina’s Center for Global Initiatives, the award provides need-based funding to students with little or no travel experience, allowing them to research, study, work and volunteer across the country and the world. During her summer in Vietnam’s Long An Province, Miceli is interning with local students from Tan Tao University to conduct interviews with nearly 40 patients at a local hospital, exploring how various treatment methods affect depression — an illness surrounded by intense stigma in Vietnam. Every four weeks, Miceli measures the effectiveness of depression treatments by surveying patients to evaluate their symptoms, including insomnia and social withdrawal. With the help of her Vietnamese collaborators, she will continue to direct the study once she arrives back in the United States for the fall semester. The experience has already affirmed Miceli’s future plans to study the human brain. Miceli is one of 54 students — many of them first-generation college students and first-time international travelers— who have traveled around the world with the Carolina Global Initiative Award over the past six years. Brandy Arellano, program manager at CGI, said the goal is to make travel accessible to all students, including transfer students, veterans and others who don’t traditionally pursue global experiences during college. Miceli has experienced this growth firsthand. 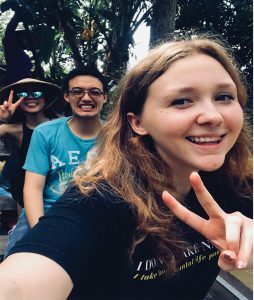 In her two weeks in Vietnam, she has become confident in navigating the city, working with peers and getting to know the locals.